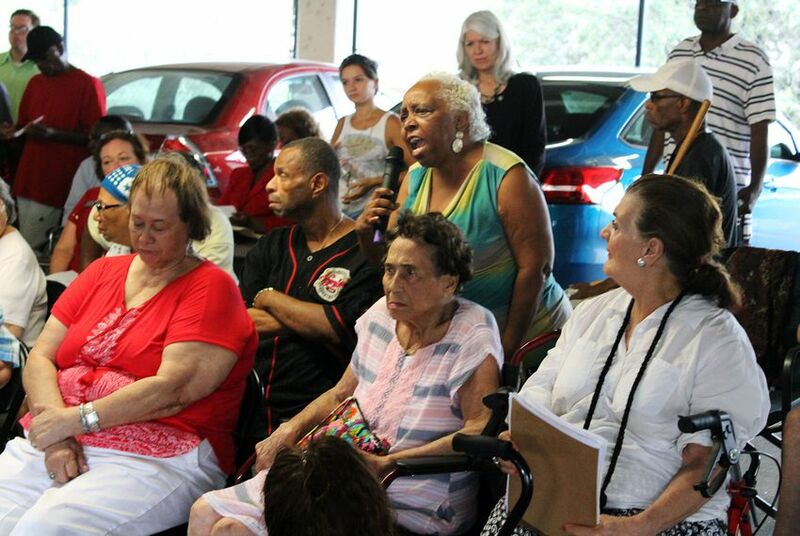 HOUSTON — The elderly residents of 2100 Memorial, a publicly subsidized high rise along Buffalo Bayou, unleashed a torrent of criticism Thursday against public housing officials who issued them eviction notices this week. And since the building's first floor is still unusable after Hurricane Harvey's historic rains flooded it, the Houstonians had to pack the second floor of their parking garage to vent their mounting frustrations. Most of 2100 Memorial’s residents stayed through Harvey's epic rains, even when they lost power and running water. For weeks after the storm, they remained in units many said were unharmed by the flooding. Government entities and housing advocacy groups have scrambled in the weeks after Harvey to determine the extent of the storm's impact on Houston-area residents who have public housing vouchers or live in buildings, like 2100 Memorial, whose developers received tax incentives in exchange for offering discounted rents to low-income people.